On October 16 & 17, the Corning Museum of Glass will host its 54th Annual Seminar on Glass. This year, Seminar will focus on Pyrex and Material Culture, complementing our current Pyrex exhibition. Seminar speakers will address themes including: Pyrex and material culture, our personal connections to Pyrex, advertising and its role in the popularization of Pyrex, and women and the professionalization of home economics. Additionally, this year’s Seminar will feature a panel discussing the design of Pyrex, led by Rob Cassetti, senior director of creative services and marketing at The Corning Museum of Glass. In advance of Seminar, I sat down with Rob to learn more about the upcoming design panel. Rob, how are you connected with the Pyrex brand and design? Before becoming a designer myself, I had an internship at Corning Consumer Products, which included the Pyrex brand and I worked closely with many of those designers. I remember being fascinated watching the progression of a design as it went from the designers and into product testing. For us, product testing meant taking these new designs directly to the public, many of whom were here visiting the Museum. Seeing this immediate feedback was great! So it seems design and marketing went hand in hand for Pyrex goods. Is that right? Absolutely. The design and marketing department worked together almost immediately to realize a product. The consumer products design department was started in 1948, but there was a strong design culture in Corning that began with Steuben in the 1930s. That was the same period when the profession of Industrial Design was first developing. Arthur Houghton, the President of Steuben, championed design as a business edge for Steuben for everything from graphics to architecture. That philosophy was adopted by Corning by the 1950s. 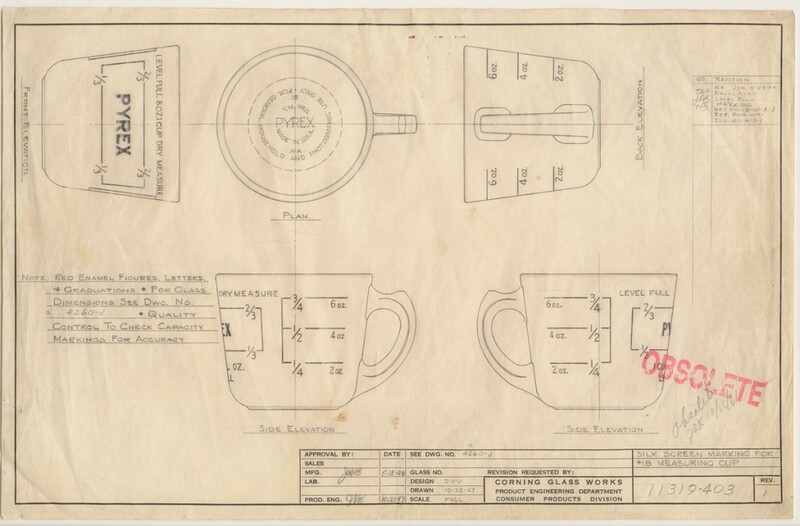 The designs for consumer products like Pyrex were unique for Corning in that style and consumer preference played such a big role. How so? The design for Pyrex was driven by consumer taste as well as the design’s relationship to how it would be utilized in the kitchen. Not only were Pyrex goods and designs taken directly to the public, Pyrex was also often tested in kitchens throughout the Corning community. In fact, I can remember my own mom testing Pyrex goods in our kitchen when I was growing up! Silk screen marking for #18 measuring cup, “11319-403”. Corning Glass Works, Product Engineering Department, Consumer Products Division, October 20, 1947. CMGL 143341. Is there something you find extremely interesting in regards to Pyrex design that you’d like to explore further in this year’s Seminar panel? I’d like to look at some of the iconic Pyrex products, like the Pyrex measuring cup. The designer, Dennis Younge will be on the panel. Designers had to work within the limitations of high-volume manufacturing processes. This technology limited what types of designs could be realized. I’m fascinated as to how these great, iconic designs made it through the system. Designers had to think: what can this technology make? How can we work with it and not compromise the design itself? I think some of these stories are really interesting and I’m hoping we will explore this a bit more during the panel. If you’re interested in hearing more about Pyrex design, join us for this year’s Seminar! For more information and to register for Seminar, visit http://www.cmog.org/seminar.